The government is unveiling its plans to reform the House of Lords, with MPs to vote on how many members should be elected and how many appointed. But what is the current situation? There are about 750 peers who have the right to sit in the House of Lords and take part in debates and votes. Of those, about 600 have been appointed for life. Most hereditary peers - people who inherited their title - were removed from the House of Lords in 1999 in the first stage of reforms. However, 92 hereditary peers were allowed to keep their seats. Up to 12 law lords also sit in the Lords - their main work lies not in debates but judging cases in the highest appeal court in the UK. There are also 26 Church of England archbishops and bishops who can speak and vote in the Lords. 14 peers are on a leave of absence. A by-election is in hand to add a 92nd hereditary peer. Life peers are appointed in a variety of ways. Up until 2000, life peerages were handed out as part of the Queen's New Year's and Birthday Honours. The creation of the House of Lords Appointments Commission means this now generally happens at other times of the year. There are two sorts of life peers. The first are non-party political peers who are recommended by the House of Lords Appointments Commission. They are people "with a record of significant achievement within their chosen way of life that demonstrates a range of experience, skills and competencies... who are able to make an effective and significant contribution to the work of the House of Lords". The second category are party political peers (often known as working peers). Party leaders are able to nominate a certain number of people each year to join their benches in the Lords. The actual number of people nominated, and the number per party is decided by the prime minister. The prime minister also decides when new peers are nominated. The appointments commission vets these candidates for propriety, but not for their general suitability. It can voice concerns to the prime minister, who has the final say on whether they should be ennobled by the Queen. In contrast to the past - especially the days when the Lords were dominated by hereditary peers - Labour is now the biggest party in the Lords, but it can suffer defeats if opposition and crossbench peers unite against the government. There is no limit to the number of peers who can be members of the House of Lords. 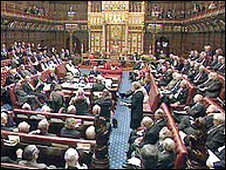 In 2003 the government proposed stripping the prime minister of the powers to decide how many peers are created, but the package was put on hold amid opposition to the idea of an all-appointed House of Lords. Ministers have to find a way forward, after peers reject MPs' proposals. What should happen to the Lords?